Based in Michigan, Keri Gardner has been writing scientific journal articles since 1998. Her articles have appeared in such journals as "Disability and Rehabilitation" and "Journal of Orthopaedic Research." She holds a Master of Science in comparative medicine and integrative biology from Michigan State University. Swimming has been used as a form of physical therapy for many years. The properties of water allow you to perform exercises that would be difficult on land. Water provides buoyancy and resistance, and water disperses body heat during exercise, thus preventing overheating. Swimming exercises for tendonitis depend on the location of the injured tendon. For instance, the Achilles tendon can benefit from swim kicks, while shoulder tendons could respond to front crawl therapy. A tendon is made of strong, fibrous tissue that connects your muscles to your bones. It transmits the mechanical force of muscle contractions to the bones during movement. Because it carries the load of mechanical force, it is prone to injury during excessive or sudden movement. Tendonitis is an inflammation of the tendon. It can begin slowly as an intermittent pain, but then may worsen into a debilitation that becomes too painful for daily activities, including sleep. Your body's resistance to motion is increased 12 to 14 percent in water, therefore quick and sudden movements become diminished. Because of buoyancy and resistance, swimming causes less strain during tendonitis therapy than traditional land therapy. Additionally, the load of weight-bearing tissues is reduced with an increased depth of immersion. If you stand chest-deep in water, the weight-bearing load is decreased to about 40 percent of your total body weight, which is much easier for tendon therapy. When a swimming therapy program is prescribed for tendonitis, a trained clinician or specialist should oversee effective movement mechanics. The Achilles tendon connects your heel bone to your calf muscles. It is a thick, strong tendon that enables walking, running and jumping. Swimming exercises for the Achilles tendon can begin immediately after an injury. Shallow water exercises include forward and backward walking, heel rocks and ankle circles. In deep water, short bouts of flutter kicking, sculling and running help Achilles tendonitis. Skulling refers to making figure-eight paddle motions with your hands and wrists that support or propel your body in the water. As swim therapy progresses, you can work your way up to dolphin kicks, treading and the breast stroke. The knee cap is held in place by the patellar tendon. Patellar tendonitis is frequent in athletes who jump in such sports as basketball or volleyball. Swimming exercises for patellar tendonitis begin with water stepping. In chest-deep water, practice stepping up and down one step. As you progress, the water is lowered to waist level and the gravitational load of your body weight will increase on the tendon. Flutter kicks begin with floating on either your back or stomach. The kicks progress into using fins and dolphin kicks. Deep water cycling is also beneficial in treatment of this tendonitis. Swimming exercises for the upper extremities treat wrist, elbow and shoulder tendonitis. These injuries are common among throwing and hitting athletes, such as tennis players, golfers and baseball pitchers. Beginning swim exercises include short bouts of vertical skulling. Another early therapy is deep-water stride walking while swinging your arms. 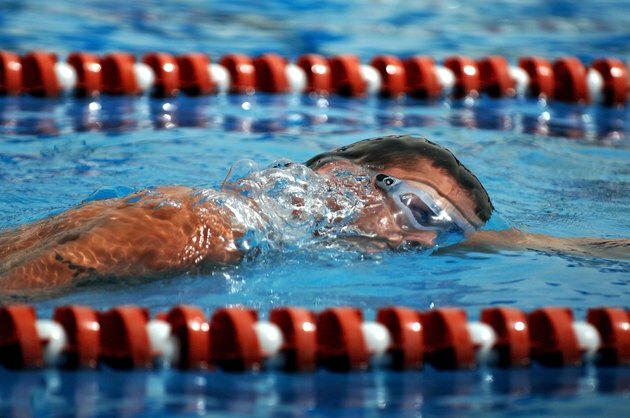 Later exercises include horizontal head-first skulling, elementary backstroke, deep water running and the breaststroke. How Many Calories Can You Burn by Running in Water?